Last updated on December 29th, 2018. Oh you guys, I am so excited to share this Green Shakshuka recipe with you!! 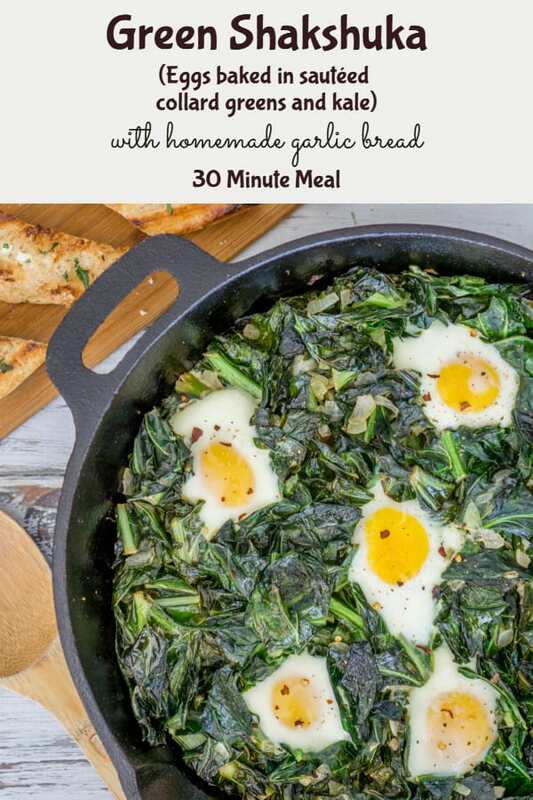 It is a delicious twist on the classic shakshuka, and I swap out a few ingredients to bring you a lighter, better-for-you option for making shakshuka and homemade garlic bread. 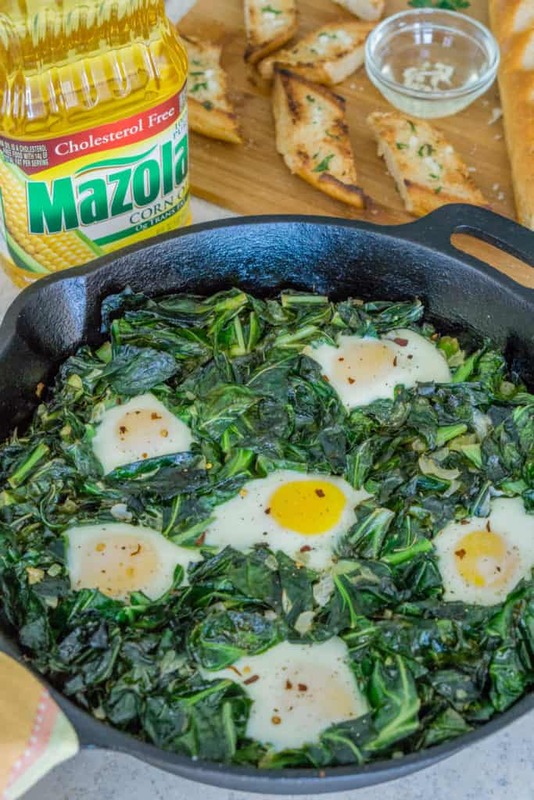 One of my swaps is using Mazola® Corn Oil instead of butter for cooking the shakshuka and for making garlic bread. A clinical study showed Mazola Corn Oil reduces cholesterol 2x more than extra virgin olive oil. To learn more about this claim, see Mazola.com. 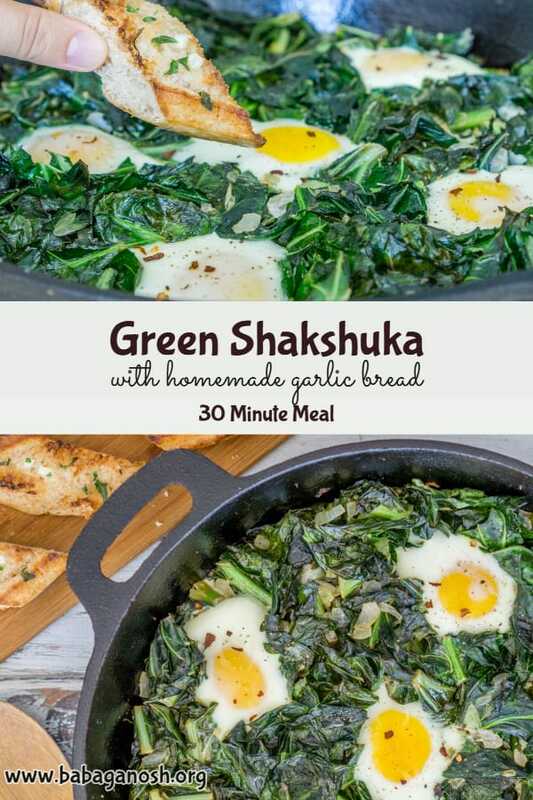 But wait, what’s a green shakshuka? 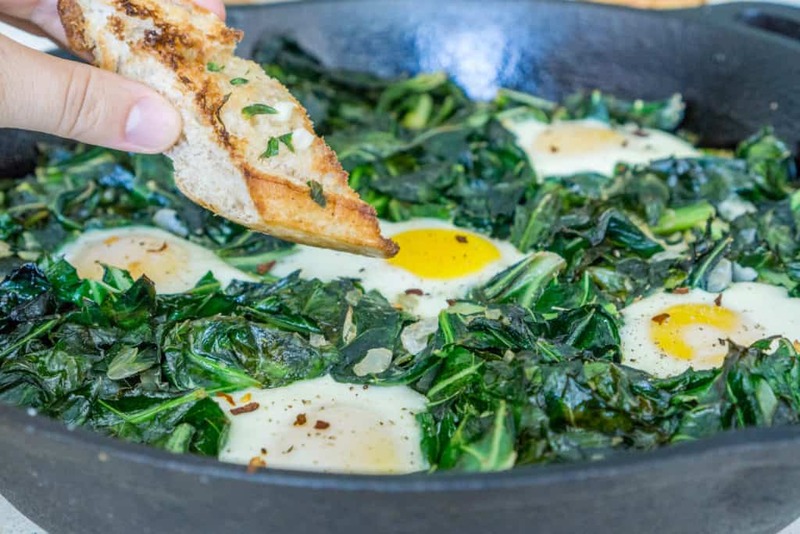 Instead of jarred tomato sauce with lots of added sugars, I used a mixture of collard greens and kale leaves to make a sauteed bed of greens for the eggs. The greens are packed with vitamins and fiber and make a gorgeous base for this shakshuka. Instead of using a white baguette to make the garlic bread, I used a whole wheat baguette which adds a lot of fiber and whole grains to the dish. Fresh homemade garlic bread is the BEST! Instead of using butter to saute the greens and prepare the garlic bread, I used Mazola Corn Oil which is an all-purpose cooking oil that is a smart heart-healthy choice for your family. 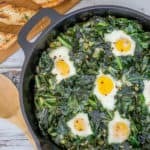 So how do I make a green shakshuka?? The collard greens and kale are sauteed in corn oil with onion, garlic, and a couple of spices that give the dish a wonderful taste. But don’t worry this recipe is not spicy, it just has a really nice warming flavor from the spices. After the greens are sauteed for a few minutes, you will make several dents (I like to call them “nests”) in the greens and crack fresh eggs in there. You’ll transfer the pan to the oven and let it bake for just a few minutes, until the eggs are cooked to your liking. 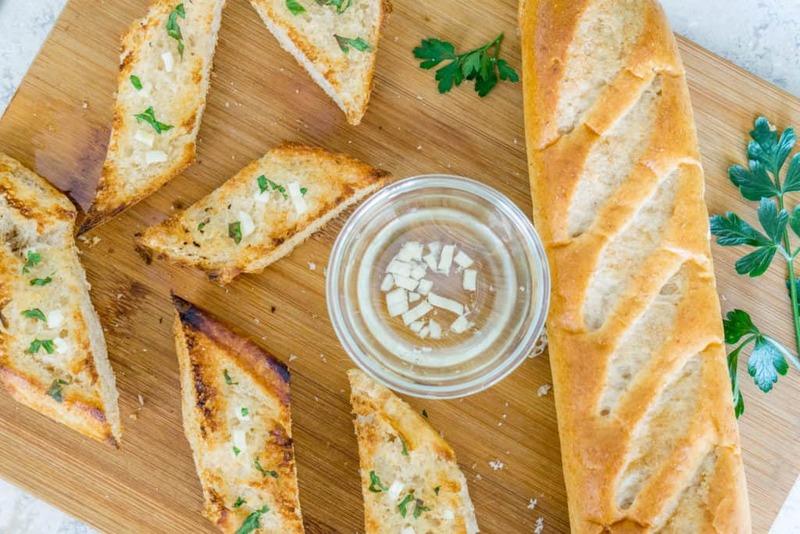 In the meantime, you’ll prepare the garlic bread by brushing garlic-infused corn oil on the baguette. Once the shakshuka is finished baking, you’ll broil the baguette for 1-2 minutes. And that’s it! The garlic bread is ready for dipping into the runny yolk. So good! 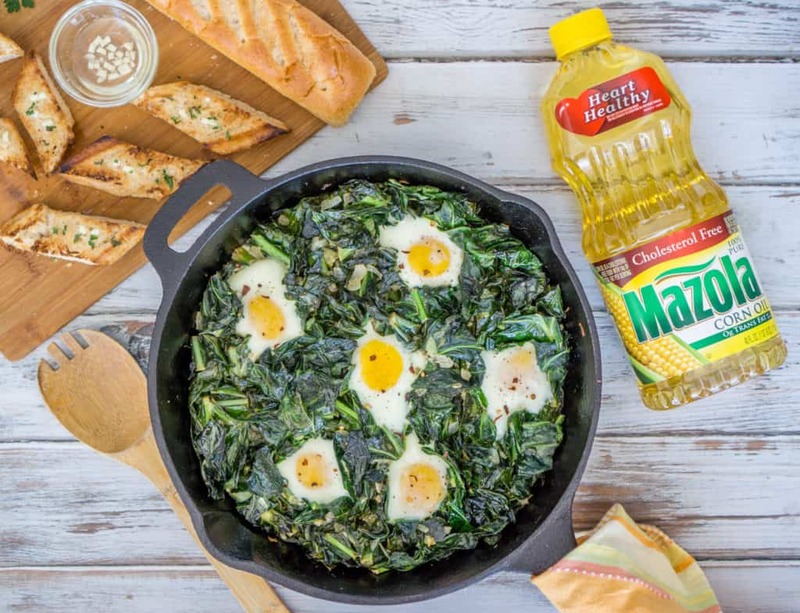 Mazola corn oil is used two ways in this recipe: to make garlic-infused oil for the garlic bread, and to cook the collard greens. I love how versatile it is and how it can be used in a variety of ways: it can be used in baking, sauteing, stir frying, or for marinades/dressings too. Corn Oil has a neutral taste and the flavors of the dish really get to stand out when you cook with corn oil. That’s why it’s perfect for homemade garlic bread!! That garlic-infused oil smelled so good that I wanted to dip my bread into it. For a keto-friendly version of this recipe, skip the garlic bread and serve this green shakshuka with crumbled feta cheese on top and a few slices of avocado. This shakshuka recipe is ready in less than 30 minutes, and that’s with making mouthwatering, warm garlic bread! So that is perfect for when we are hungry and need food to be on the table quickly. If it wasn’t for quick and easy recipes like this one we would definitely not be getting as many greens and veggies in our daily diets. 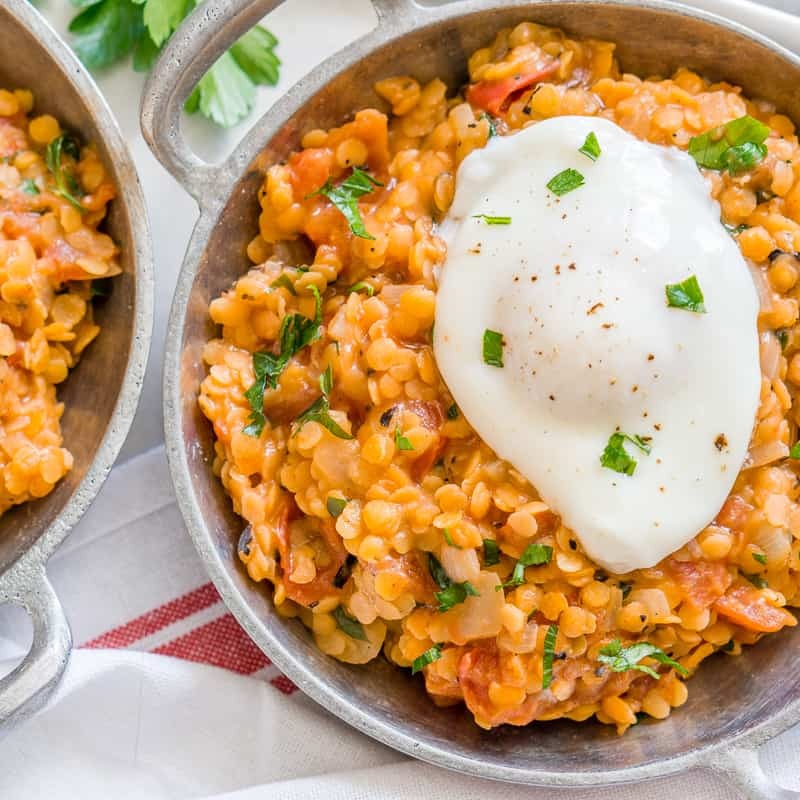 Give this recipe a try and please come back and let me know how you liked it! I’d love it if you left a comment below, rated the recipe, or saved it on Pinterest for later! Green Shakshuka is a lighter twist on the classic Shakshuka! 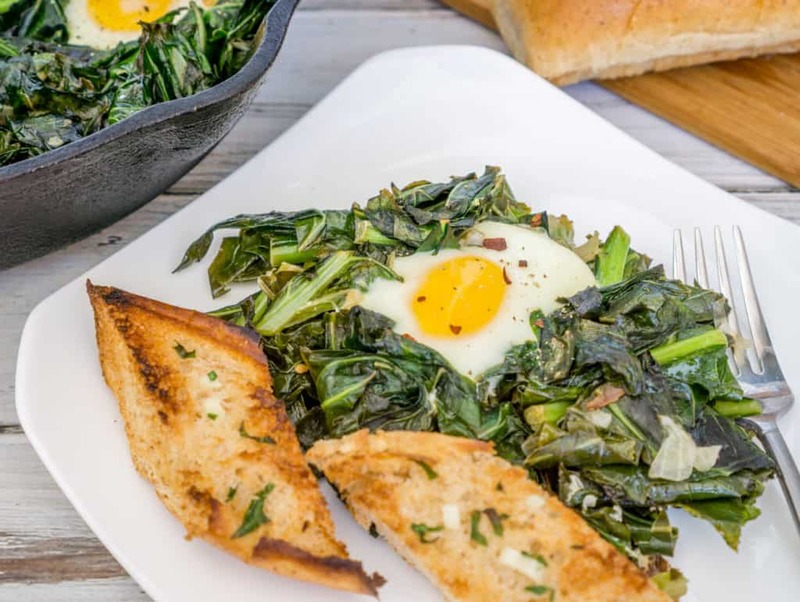 Eggs are baked on a bed of spiced sauteed greens. Serve with homemade garlic bread to dip into the egg. Preheat the oven to 400F. In a small bowl, combine 2 tablespoons Mazola Corn Oil with half the minced garlic. Set aside while you cook the shakshuka and let the oil get infused with fresh garlic. In a large oven-safe skillet, heat the remaining Mazola Corn Oil and add the diced onion and minced garlic. Saute for 2 minutes over medium heat. Add the ground cumin and ground coriander and saute for another minute. Add the collard greens and kale, salt and pepper, and a pinch of red pepper flakes. Gently stir until the greens start to wilt. Add the lemon juice and continue to cook on medium heat for about 10 minutes, stirring every few minutes. Make 6 dents in the greens. Carefully crack an egg into each dent. Season the eggs with a bit of salt and pepper. 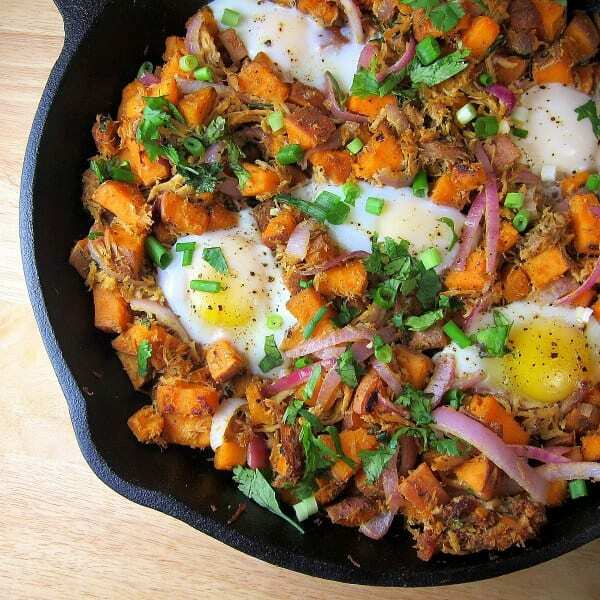 Carefully transfer the skillet to the oven and bake for 5-10 minutes, or until the eggs are cooked to your liking. (5 minutes will yield a runny eggs, in 10 minutes the eggs will be fully cooked). While the eggs are cooking, brush the baguette with the garlic-infused Mazola Corn Oil. Season with a pinch of salt and sprinkle with fresh herbs, if desired. Slice the baguette into 2-3 inch pieces. Place the baguette on a baking sheet. Remove the shakshuka from the oven and allow to cool. Turn on the broiler and broil the baguette slices for 1-2 minutes, or until they turn golden-brown. (Make sure you check on the baguette after 1 minute, the broiler can burn food quickly!). Remove from heat and serve with the Green Shakshuka. Season the shakshuka with additional red pepper flakes and/or fresh herbs, if desired.